Well, here’s a nice way of putting things. 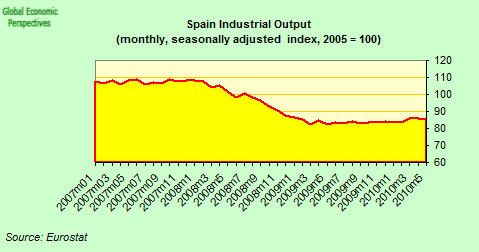 Spain did less badly than expected in Q2 2010 as compared with a year ago, since in Q2 2009 it actually did worse than it initially appeard (following a downward revision in the data). Well, that’s one way to improve, push the past backwards. On a more serious note, the detailed data on the second quarter are now available for Spain, and interesting reading they make. Basically, what little improvement Spain did manage to achieve (0.2 q-o-q, -0.1% y-o-y) came from domestic demand and not exports, while the external trade balance deteriorated. Exactly the opposite to what you want to happen. As the statistics office (INE) say: “On analysing the two large components of Spanish GDP from the perspective of expenditure, a similar pattern of performance could be observed as in the previous quarter. Thus, on the one hand, the negative contribution of domestic demand to GDP decreased two points and three tenths in this quarter, from â€“2.8 to â€“0.5 points. 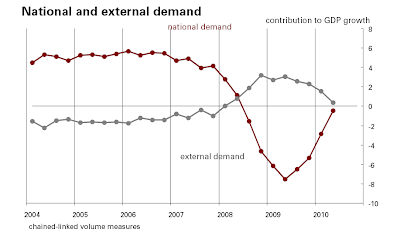 Whereas, in contrast, foreign demand decreased its positive contribution to the aggregate growth one point and one tenth, from 1.5 to 0.4 points”. In other words, all that deficit spending money is simply getting wasted, and there is no competitiveness correction taking place. In the midst of a huge potential export boom, Spain’s economy is growing thanks to domestic demand, as the trade deficit once more deteriorates. So one very simple way of putting this, so everyone can understand, is that the Spanish government is running a double digit deficit, and one part of the money spent is going straight out in additional imports which (among other places) come from Germany. That is, Spain is getting itself even more into debt to lend a kindly helping hand to the German economy. 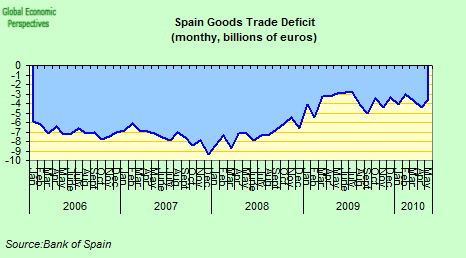 In theory, the exact opposite was to happen, and the German expansion was supposed to help Spain’s net exports. 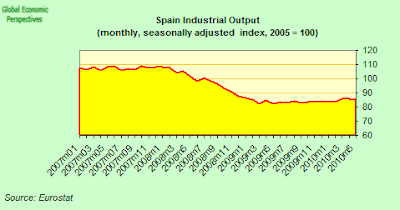 But Spanish industry isn’t, well you know..
And just to remind us, here are the respective industrial output charts I published in this post. So when are people at the EU Commission and the IMF going to finally wake up to reality? This isn’t going to work like this, and Spain needs to adopt concrete measures to restore competitiveness, and not find ever more ingenious ways to kick the can even further down the road. Either that, or we will all live to regret our own inaction one of these fine days. If I remember correctly, there are some accounting procedures that can skew the above chart. The main one, particularly in Spain’s case (again, if I remember correctly) , is housing which counts as national demand even if it is foreigners buying. Having said that I am not sure that I see too many foreigners buying – and I have heard different accounts from different sectors of real estate. Certainly we are nowhere near previous levels of sales though – but with GDP lower now those that are occuring may have some effect. The strong rise in german exports in the first half of this year was not caused by demand in the rest of the eurozone. It was rather rapid rising demand in asia. Even within the eurozone, the growth in exports to spain was sub-average. 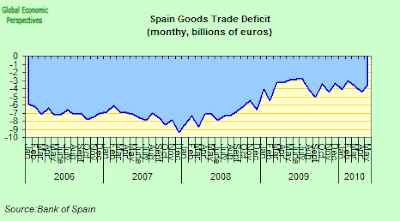 Exports from spain did actually rise in th first quarter. Since you probably know all this perfectly well, could you cease to use such demagogic language? 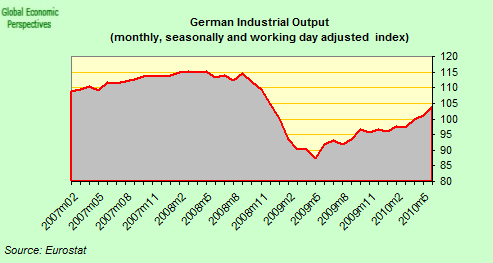 By the way, whatever happened to your prediction of a double dip recession this year in Germany? It got put back a bit, try the fourth quarter of this year. As you say, emerging market demand has been very strong in the first half of this year – stronger than I expected – and it may well hold up into the third quarter, I think this is an empirical question, and we will have to wait and see. Also as I keep indicating, many Euro Area countries (ex Greece) are not applying their fiscal targets as rigourously as promised (this could be a good or a bad thing depending on your point of view) and this, as I am saying here, is giving some uplift to German Eurozone exports. German exports of goods and services gained a sizeable non-annualised 8.2%Q during 2Q 2010 (which translates to an eye-watering pace of nearly 35% in annualised terms). A considerable part of the bounce is due to catch-up. Compared to last year, exports of goods and services are now up 18%Y. 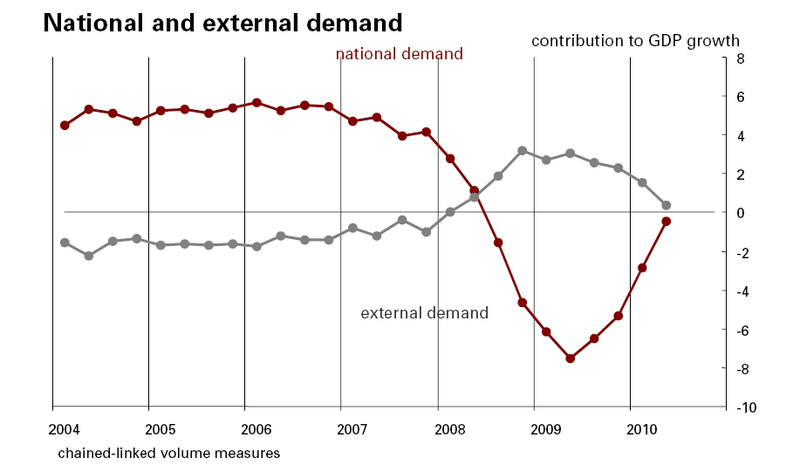 The biggest contributions to the rise in overseas demand for German merchandise, totalling 28%Y in June,came from the rest of the European Union (which accounted for half of the export growth), followed by Asia (which at 6.9 ppt accounted for a quarter â€“ half of which is down to China). The US only added 2.4 ppt export growth. Emerging markets clearly outweighed the euro area (at less than 5 ppt) and the US at 2.4 ppt in terms of the contribution to export growth. However, several indicators suggest that the pace in foreign demand growth will moderate going forward. I readily admit that this quarter – somewhat unexpected in Germany – was a blip. Still, growth slowing down somewhat is not the same as a douple dip recession. As far as I understand, year on year growth in exports of 17% like in this quarter would bring exports back to the level of 2008. That would be a recovery, however the exact distribution of growth over the quarters. And as pointed out in the post below my lats one, the demand isn’t coming out of the euro-zone. And in relation to german exports, the euro-zone is France and the Netherlands, not Spain and certainly not Portugal, Ireland and Greece. So this simplified model: Imports to Spain and Greece = exports from Germany is really misleading. United in diversity or union of nations ? It is up to the people of Europe to decide what they buy, it is up to Spanish legislators to decide on the rules for banks that work in their country, it is up to the government to decide whether to prime car sales or bail banks, whether to borrow more or tighten up etc. These ARE the rules . In other words Spain has a large control. Now whether the European ‘project’ is just derailed or seriously derailed is another topic. The write-offs by Spain in the future will be write-offs for Germany, France etc. too. So simply keeping things turning slow for a year or two makes little difference, it buys time for everyone to say…humm. Spain has tourism and property purchase (plus some car sales, arms sales etc.) for foreign income. Foreigners can walk from their homes here if they go deeply underwater, so there goes some (repayment) income. Tourists can stay at home. The Spanish, although slightly underproductive, know how to work in production too . Unfortunately the market is pretty cornered , and may become more so. Oil is at 80 dollars @, we use all of it, whatever the price (which is ‘normal’). Do we really know where the global economy is headed, where inflation might really come from (i.e. abroad). If you take someone from say ten or twenty yrs. ago and placed them in today’s Europe, the first thing they might say is “isn’t it doing well”. So instead of arguing it might be more useful looking at how Europe can consolidate its gains (and Ed. is right in criticizing Spain’s endless spending – as long as you prefer Ed. criticizing and stability still..). I imagine it will take several years to sift through this mess, and if we are sensible along the way, will hopefully emerge with a stronger and more efficient Europe. I would prefer to see banks and countries throwing scrumpled obligations back at each other than having borders you cannot cross and anything at hand being tossed in the others direction. Spain may subliminaly not have escaped from thinking it can inflate its way out of debt, and that is a Spanish problem , at least as long as it remains within Eurozone. And thank you for your reasoned response. I readily admit I underestimated the potential for export upside this year when I spoke about the possibility of Germany’s economy falling back last winter. Actually I made the same mistake back at the end of 2007, and didn’t see Q1 2008 coming. I also overestimated the extent to which Spanish employment might grow and grow – it now seems stuck around the 20% mark – and overestimated the capacity for Spain’s economy to experience a price correction (even like the Irish one). We all make mistakes, we are all human, and economic forecasting is not an exact science. But what I try to draw attention to are the deep structural features of the surface phenomena. I am not in any way saying that the peripheral economies are the main drivers of German exports, what I am saying is the failure of competitiveness policies to straighten out the periphery problems (which are not simply fiscal deficit ones) mean that the ECB help and the govt deficit spending is being wasted, since they are increasing commercial trade deficits which were decreasing. So I am criticising the administration in these countries (and indirectly the EU commission and the IMF) and not the German performance. The problem is not too much competitiveness in Germany, it is a lack of it elswhere. Some put it this way, the Spanish export sector is simply too small to save the country from ultimate bankruptcy (if nothing is done). But how to expand Spain’s industrial export base rapidly enough to avert disaster. Ah, here there is silence. Incidentally, I have a fuller analysis of the recent German performance in the Baron von MÃ¼nchausen post I have just put up. It may be no more to your liking, but at least it gives a fuller exposition of what I think. Basically, export dependence is not a good think for anybody, but having gotten into the thing, it is now a lot more difficult to get out. IM: Export is everything my friend, what is saying Edward is not from now, is from beginning, who give us the money for debts and where is the money now? Why Germany can export to China now? Because the German commercial agreement with China or the EUROPEAN agreements with China? How China now is able to buy expensive German products w/o the commercial deficit with the whole Europe? Which was the sacrificed industry in those agreementsâ€¦ the German one? Where is the European political construction? Now is not good? Now is a question of good guys and bad guys?